As you may know, for the past five years the Office of Community Relations has been conducting an "Annual Winter Coat Drive" for needy children in our school district those families can't afford to buy them a winter coat due to financial hardship. For a child, a brand new coat can be more than a coat - not only helps to keep him/her warm, but also can change a child's life and empower him/her with greater self-confidence, peer acceptance, increase school attendance and overall wellness. Christmas is truly the season of the giving. Not only giving gifts, but giving back to the community, in special to those less fortunate than others. 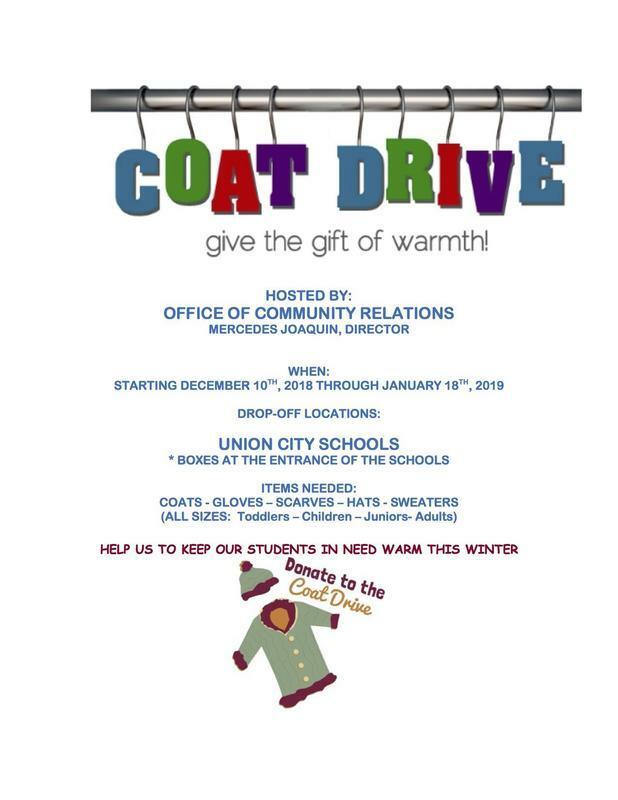 With that being said, I respectfully ask our school community to contribute with this charitable drive giving a GIFT OF WARMTH to our students in need donating a brand new or gently used winter coat. Your gift will have the ability to transform a child's life and relay the message; "YOU ARE WORTH IT". Donations will be collected at the entrance of the Union City Schools starting December 10, 2018 and ending on January 18, 2019. In advance, I thank you for your involvement in assisting our needy students and for your generous hearts!